If you send tests to multiple email addresses within your organisation, it is worth while creating a test group of these email addresses so that you can send one test to all contacts required. Hover over the 'Audience' tab. Select 'Test Group' from the drop down. Click 'Create New'. The screen will refresh and you will be taken to the test group. Click Select Existing Contact. Because the contact must be in the database already, you cannot type the address into the box, you must select them from the database. This will bring up a boxto search for the email address from your database. 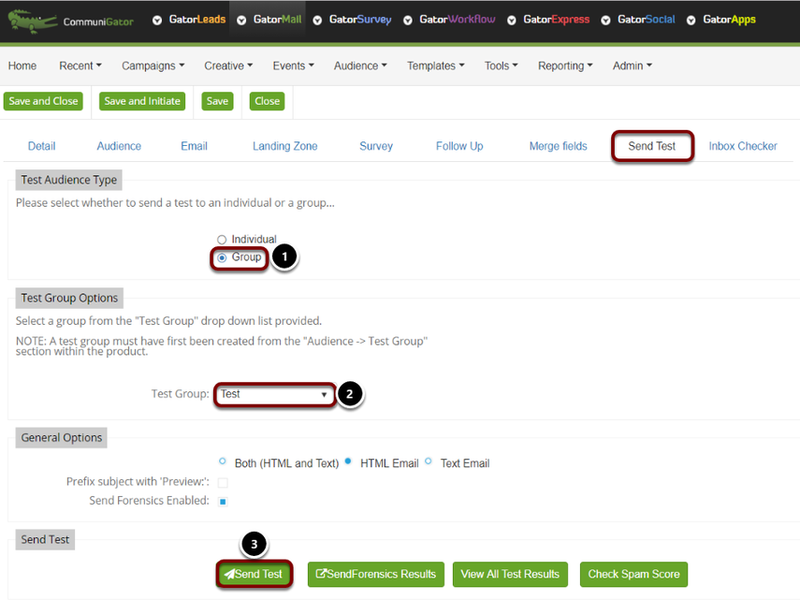 Once you have selected the contact click 'Create New Test Group'. Repeat these steps until you have added all the members that you need, then hit save and close at the top. Sending to a Test Group is virtually the same as sending to an individual. 2. Choose a group from the drop down. 3. Click 'Send Test' once you know everything is built and as you want it. The Test email won't mimic a contact from the database like an individual test does, so any personalisation on the email will be relevant to the test recipient.